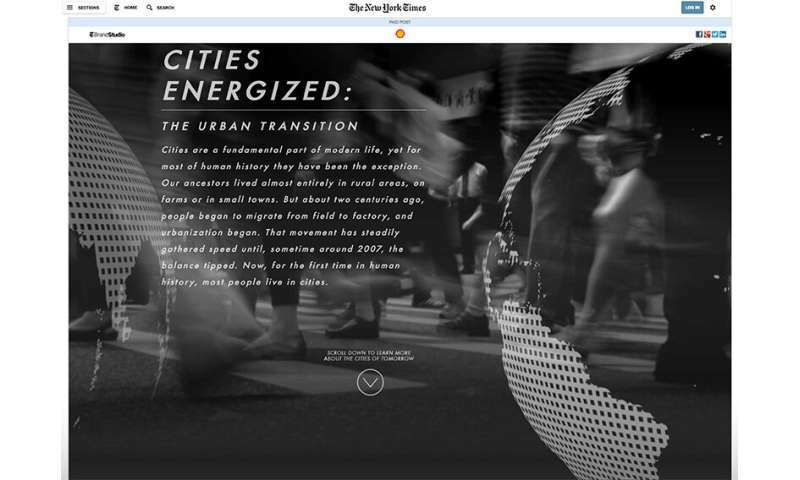 This native advertisement published on the New York Times website is marked as a "paid post" at the top along with the logo of the advertiser, Shell Global. Today, there are more and more available measures to avoid advertising, such as using ad-blocker software, fast-forwarding through commercials, or choosing ad-free media streaming services like Netflix. This has forced advertisers to get creative to put their messaging back in front of digital consumers. Also known as sponsored content, native advertising inserts paid messaging right into the mix alongside news articles. Buzzfeed was an early adopter of native advertising as a profit-making model, but these days the New York Times, Wall Street Journal, Washington Post, Boston Globe, and nearly all major news sites are profiting from content paid for by advertisers. One estimate by Forbes says that native ads will be a $21 billion industry by 2021 and account for nearly 75 percent of all ad revenue by then. But not only is there more of this content, it's gotten better, too. So much better that it's beginning to fake out readers. And that's troubling, says Michelle Amazeen, a Boston University School of Communication assistant professor of advertising. Her new research, based on an online experiment she conducted, revealed that most people can't tell native advertising apart from actual news articles. Even though her online survey divulged to participants that they were viewing advertisements, many people—more than 9 out of 10 participants—thought they'd been looking at an article. "I think it's contributing to people thinking that news media are sharing fake news," says Amazeen, corresponding author on the study, which was funded by the American Press Institute. During the survey, the participants viewed content from an actual Bank of America advertisement, a 515-word piece titled "America's Smartphone Obsession Extends to Online Banking," which was created for Bank of America by Brandpoint, a content marketing agency. Participants viewed the advertisement, which included a disclosure identifying it as an ad—the Federal Trade Commission requires that advertisers include such a disclosure—and then answered a series of questions. "We found that people are more receptive to what they're looking at if they know what they're reading," Amazeen says, even if they know they're reading an ad. If, on the other hand, an advertiser makes it difficult to detect content as being an ad, a substantial amount of people have negative reactions when they realize the truth. "A lot of people equate this to fake news," Amazeen says. "Trust in media is at an all-time low…. I'm not suggesting it's only from native advertising, but I think it's a contributing factor." Although advertisers are required to disclose their ads as such, typically with a label like "sponsored" or "paid promotion," not all disclosures are created equal. Depending on size, placement, and other factors, some advertisers and publishers are more upfront than others about the nature of their content. Amazeen says the lack of standardized requirements for native ad disclosures is fueling the problem of people not being able to recognize what's a sponsored story and what's a news story. One big risk, Amazeen says, is that if someone doesn't realize they're looking at promoted content, they may think they're getting the whole story on a given topic. "Advertising is supposed to be true and accurate, according to the Federal Trade Commission," Amazeen says. But, she adds, ads often "leave out certain information that isn't favorable for whatever perspective they are trying to convey." "A lot of legacy and digital-only news organizations do fantastic investigative reporting and break important stories, but at the same time, they're shooting themselves in the foot," Amazeen says. Politico, for example, runs a fake news database, filled with news stories that its reporters or readers have found to contain doctored videos, images, or hoax-like disinformation. However, Politico's own news feed is sporadically interspersed with advertisers' articles labeled as sponsored. "Politico's concern with the origins of political disinformation seems pretty rich given its work with Cambridge Analytica," Amazeen wrote in an October 2018 tweet. 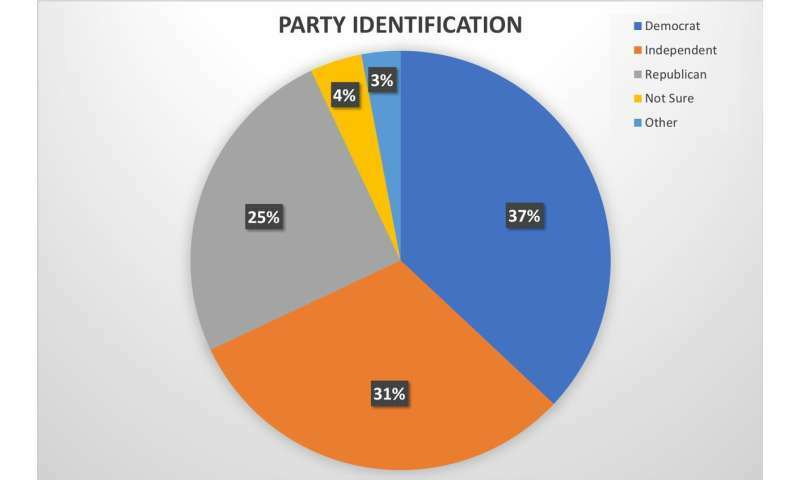 During the 2016 presidential campaign, political consulting firm Cambridge Analytica helped target 10,000 ads to different audiences. Brittany Kaiser, who was Cambridge Analytica's business development director at the time, has called one native advertisement on Politico, "the most successful thing we pushed out." In March 2018, an article in the Guardian reported, "One of the most effective ads, according to Kaiser, was a piece of native advertising on the political news website Politico, which was also profiled in the presentation. The interactive graphic, which looked like a piece of journalism and purported to list '10 inconvenient truths about the Clinton Foundation,' appeared for several weeks to people from a list of key swing states when they visited the site. It was produced by the in-house Politico team that creates sponsored content." The advertisement on Politico, which was labeled at the top as "sponsor-created content" and "paid advertisement for and created by Donald J. Trump," garnered an average of four minutes of engagement from its readers in key swing states. "The line of caution is when you start mixing news with advertisements and blurring those lines—that's where you have to take a step back and really think about what you're doing," Amazeen says. It seems very hard to distinguish especially when they show up on sites like this one. There is no difference any more. News is dead. RIP. The average IQ is 100. @Jeffhans1, perhaps you'd care to show us some of the sponsored content you claim this site uses. Let me guess: evolution, the Big Bang, or global warming? "One big risk, Amazeen says, is that if someone doesn't realize they're looking at promoted content, they may think they're getting the whole story on a given topic." And how exactly does that differ from actual news that is published by a biased media????? So how do we get ourselves to throttle back on the use of deception in cases like this? Because that's basically what this is; an advertiser is hitching a ride on a trusted information source and consciously representing itself as part of that trusted source. What a mess. Get the "trusted info source" to not allow it as part of their business model. Well that is the million dollar question isn't it. What is a trusted news source? While I consider Fox news to be in the middle of the political spectrum others consider it to be an ultra right wing news source. That is a very sad commentary on the gap that divides our nation. Political beliefs are closer to a religion than to fact based decisions. "The Conversation US arose out of deep-seated concerns for the fading quality of our public discourse – and recognition of the vital role that academic experts can play in the public arena." -Academies with nothing better to do than propagandize for hire. "The Conversation's mission is particularly resonant in the U.S., where people universally sense that the country's social fabric is strained and the common ground people share is shrinking." "Associated Press/Reuters distributes The Conversation US... [It] seeks to be part of the solution..."
-These bogus bias peddlers are the cause of this dysphoria. That's their MISSION. People in this country are getting too smart for their antics... one of the reasons they want to flood the country with immigrants who are innocent to this kind of manipulation. An aging population is harder to manipulate. Otto, oh the horror, you are beginning to sound lie me. Otto, oh the horror, you are beginning to sound like me. Has no bugger heard of Adblock, and similar browser add-ons? Almost everything from The Conversation seems to be reposted articles that I can't help but believe are sponsored based on their unscientific writing and views. Fairly simple. Remember the old computer game......'Deer Hunter' where a deer turns the tables and hunts the hunters? He has a call to draw in hunters: a woman's voice, seductively calling "Help, I'm naked and have a six pack of cold beer and I'm hotter than the pizza! "...Guaranteed to bring in the hunters with I.Q. 's of par golf. Well! That is what the 'sponsored' articless in 'Yahoo' do: they use pictures of half dressed women with the 'come on' that if the fool clicks on it then...THAT IS WHAT HE GUARANTEED WILL NOT SEE!. What usually is fed to the sucker is a tiresom boooring series of booring pages to keep the sucker flipping while each page contains some kind of malware or suspicious content in invisible frames....and probably viruses too. One NEVER sees that c'mon picture. Also, sponsored content is identified as such in Yahoo, so far. A tiny very light blue notice at the top or bottom of the suspicuous post in the Yahoo main or whatever page of dross. @Jeffhans1, you haven't linked any articles, much less shown any sponsored content on this site. You either got it or you don't. You don't. We done here?